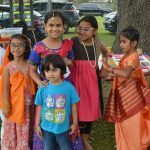 The 8-week long Gopa Kuteeram Summer Camp 2011, conducted by Global Organization for Divinity Houston, came to a colorful close last Saturday with performances and presentations by the participants, at Houston Namadwaar. The camp, that was held every Wednesday from June 29 to Aug 17, offered its 8 to 15-year-old participants an opportunity to immerse themselves in Indian culture and universal spirituality while at the same time learning creative skills through special workshops in photography, canvas painting, origami, creative writing, culinary arts and cricket. A unique concept of Tri-Yoga – that included exercise yoga for the body, shravana yoga (yoga of listening) for the mind and Nama yoga (meditation by chanting the Divine Name) for the soul – was among the key activities of the camp. 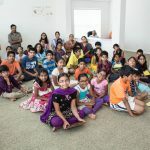 “Values for life” such as love, compassion, gratitude, faith, forgiveness, courage and humility were constantly emphasized throughout the program through several activities including listening to true stories of great Indian saints, maintaining a Gratitude Log, learning and singing the “Song of Values” (courtesy GOD Australia) and practicing a play based on the life of Prahlada. 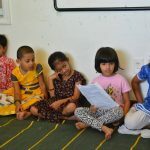 Numerous games such as Hangman, Family Feud, Dumb Charades, Hot/Cold, Block and Tackle, Ad-Zap and Treasure Hunt, all themed around the camp and our scriptures were played. A field trip to Brazos Bend State Park was also part of the camp. 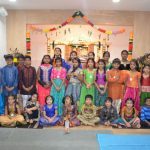 On Saturday, August 20, a final end-of-camp celebration was held at Namadwaar where the children performed the Prahlada play and the Song of Values, and presented their research projects. Awards, certificates and trophies were given away to all the participants. 13-year-old Muktha Nair won the Gopa Kuteeram Spirit Honor Award that recognized the participant who had most completely absorbed and exhibited the values and spirit of the program. 12-year-old Maya Iyer won the Best Overall Performer in Workshops award for her performance in the workshops. 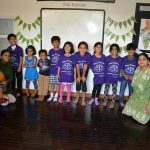 8-year-old Varshitha Krishnan and 9-year-old Vishnu Sadagopan won the “Most Dedicated and Enthusiastic” award for their exuberance, interest, committed work throughout the camp. Awards were also given away for outstanding performance in each workshop and activity. These winners included Shilpa Sadagopan (Photography), Rini Maiti (Canvas painting), Gopinath Kumar (Origami), Shroothi Ramesh (Tri-Yoga), Tejna Dasari (Games), Karun Salvady (Creative Writing), Vyas Easwar (Cricket), Rohit Raina (Acting), Nithya Dwaritha (Culinary Arts), Shikha Lakhi (Gratitude Log and Value-Able Tales), Rhea Raina (Good conduct) and Muktha Nair, Nathan Dasgupta and Rohith Raina (Perfect Attendance). The participants also took home a portfolio of photographs clicked by them during the photography workshop and a book—The Power of Prayers—of their own short stories based on true incidents, written as part of the creative writing workshop.